This shot comes from the cover of the June 1963 issue of VW Australia Review. That's Ray McMahon himself at the wheel. Here you can see how the Red Terror stacked up to the tracked vehicles with which it shared the continent. Those vehicles topped out at a mighty five miles per hour. VW USA ran this ad in 1965 with the classic line, "'Now we know what it'll be like when Hell freezes over.' So if it does, you know what car to buy." 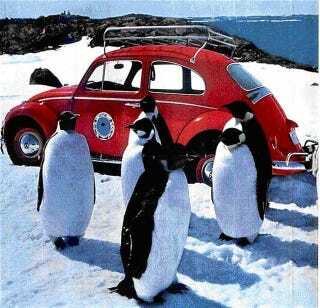 Here's a photo of Antarctica 1 in the 1964 BP Rally. In this map of Antarctica you can locate Mawson Base, which is highlighted in red.